Updated every 5 minutes with the latest real estate for sale in Kennedale - including MLS listings, homes, condos, townhomes, investment property, and land - as posted by Kennedale real estate agents and brokers - over 30% more listings than Zillow, Realtor, Trulia, and Redfin. Get Signed Up Now and get the latest Kennedale tax and HUD foreclosures, REO properties, bank owned homes, and short sales being offered at HUGE price reductions and significantly lower than retail value. Kennedale is a great community, and steadily growing suburb of the Dallas Fort Worth metroplex, which is located in North Central Texas, approximately 250 miles north of the Gulf of Mexico. This small, tight knit community has steadily expanded in the last 15 years though it kept its small town atmosphere (without being stuck in the countryside). In fact, Kennedale is served by many major highways that make for a quick trip into the downtown area, which is less than ten miles away. The area was settled during the 1860s at the site of a mineral-water well. The townsite was surveyed in 1886 and named for Oliver S. Kennedy, who platted it and, in an effort to induce rail construction through the community, donated every other lot to the Southern Pacific Railroad. The rail line eventually built a station and section house in Kennedale. Kennedale offers reasonably priced land, and a high quality of life, as well as a great environment for businesses. The city boasts plenty of parks, which offer the perfect venue for all of your family and community activities. Kennedale has a wide variety of historical landmarks and offers a dozen or more interesting museums and galleries to those interested in the arts. Top it off with great nightlife, shopping, and dining and you've got the recipe for great memories in these historic cities. The Dallas-Fort Worth area climate is humid subtropical with hot summers. Winters are mild. Periods of extreme cold that occasionally occur are short-lived, so that even in January mild weather occurs frequently. The highest temperatures of summer are associated with fair skies, westerly winds and low humidities. Characteristically, hot spells in summer are broken into three-to-five day periods by thunderstorm activity. Summer daytime temperatures frequently exceed 100°F. One thing that sets Kennedale apart is The Pier, an incredible indoor/outdoor skatepark. The Pier brings in happy skaters from all around the area. For plenty of "cattle and culture," Fort Worth offers the best in rustic know how and high class entertainment. From the historic Stockyards to Bass Hall, Fort Worth covers a wide range of interests. You can also check out the long-neck giraffes at the Fort Worth Zoo, which is ranked No. 5 zoo in the nation by USA Travel Guide. For great sports entertainment, Dallas brings you the cream of the crop. Kennedale has lots of shopping options to satisfy everyone’s shopping needs. Visit the shopping malls with premium offerings or check out the local stores downtown. Dining choices are plentiful in Kennedale, from Italian to fine cuisine there are diverse options to indulge your culinary cravings. Kennedale has massive numbers of extraordinary places to get your world flavors groove on. Find a cool hangout and enjoy a glass of wine or beer around Kennedale. You got nothing going on tonight… so maybe invite your friends and go to a nice bar with live music. The Kennedale Independent School District is an award-winning 4A school district composed of five campuses serving more than 3,150 students grades Pre-Kindergarten through 12th with a staff of more than 400 making it one of the city’s largest employers. 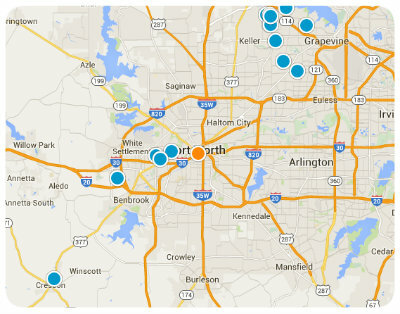 Kennedale is home to approximately 7,000 residents with a median age of 37 years old. 40% of all households have children under the age of 18 at home. With an average income just over $61,000 is the community is an ideal consumer base for any industry. Kennedale’s environment makes it easy to conduct business. The commercial and industrial sectors are well represented with highly specialized industrial companies, such as Global-Servo Hydraulics, FWT, Goss International, Excel Polymers, Speed Fab-Crete, H&O Die Supply and Grover Corporation. In addition to the amenities available in Kennedale, residents and visitors can easily reach other tourist attractions in the region. Located adjacent to the city of Arlington, Kennedale is close to the Top O'Hill Terrace and Globe Life Ballpark. Residents can enjoy a short drive to Fort Worth’s Cultural District — home of the world-renowned Kimbell Museum, the Amon Carter Museum, and the Modern Art Museum of Fort Worth. Deep in the heart of the Dallas-Fort Worth Metroplex, the city of Kennedale is a growing suburban neighborhood. The ease of access to the rest of the region is one of the main reasons for the population growth of over 17% in the last decade, as young families seek out a community that offers small town values and relationships without being too removed from the arts, entertainment and shopping offered by a larger city. Kennedale offers a range of housing choices to fit a variety of lifestyles. The quaint homes of the Old Town neighborhood are ideal for those who want to be within walking distance of the TownCenter. For those who prefer a country atmosphere, Kennedale has multi-acre residences or newly built executive homes, as well as more traditional, upscale suburban neighborhoods. What are you waiting for? The charm of Kennedale and the amenities of the metroplex are right at your fingertips. Be the first to know when new Kennedale short sales, foreclosures, deeply discounted homes, and brand new hot properties come onto the market before anyone else - over 30% more listings than Trulia, Zillow and Realtor. Do you own a home in Kennedale and want to find out instantly and completely free what it is worth in today's market - with absolutely no cost or obligation? Listing courtesy of Carrico & Associates.